Who knew beachwear for kids could be so chic? Stella Cove has an amazing selection of high end swimwear and accessories for children and women. The weather has been off ranging from the 40s to the 80s here in Southern California. However, this past weekend we experienced sunny 80 degree weather so we decided to indulge Kenzie by taking her to the beach. It's also nice that we are now about 15 minutes or so away from the sand rather than 1+hrs. The Nozomi cotton dress is precious. It features multicolored cherry blossoms on an airy white background. It's almost like a piece of watercolor art. 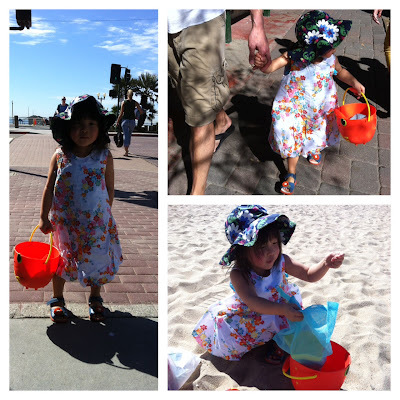 The 100% cotton sundress design features a bubble shape that is easy for play. From the onset of putting it on Kenzie started dancing and prancing waving her dress around. It's just a beautiful style that I would wear myself. Underneath her dress Kenzie had on the Perfect Day Butterfly Cut swimsuit. She is wearing size 4Y and it fits with a little room to grow by summer (this runs a wee small as Kenzie usually wears a 3). She just loved the cloud design. The adjustable strap is great for additional wear when growing. This suit was comfortable for playing in the sand and Kenzie did not want to take it off when we got home. Buy It: You can purchase the Nozomi cotton dress for $60 and Perfect Day Butterfly Cut swimsuit for $95. Make sure to connect with Stella Cove on Facebook and Twitter! Love the cloud and sky design! Not fake looking at all, very realistic! This is such a cute suit and cover up. We have had some crazy weather here in So Cal, I agree. that is simply gorgeous! what a fun day in the sun! 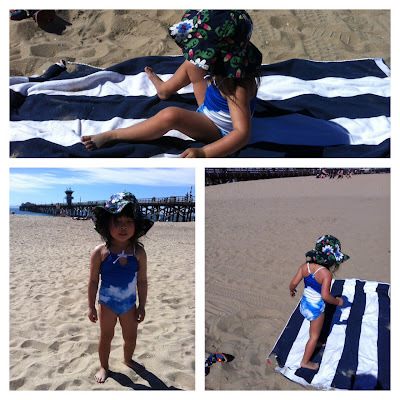 I adore the cute little Nozomi Sun Dress and the Perfect Day Butterfly Cut Swimsuit.! She is such a cute model too. Thanks for sharing the information on this website. Just what we have been looking for. Very cute outfits! A bit pricy but if you save them for future little ones or pass them on to a friend, it isn't so bad. And your daughter is quite a pretty little model! Those two outfits are adorable! That is the perfect spring dress! I really like that Kenzie's Cute Cloud Swimsuit is adjustable and it will grow with her for many summers to come. Its seems like I've been a swimsuit for my daughter(5) every year! Kenzie looks adorable in her swimsuit! !